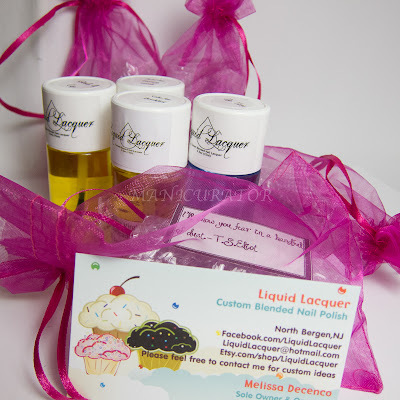 Follow Liquid Lacquer on Facebook, shop for Liquid Lacquer here. 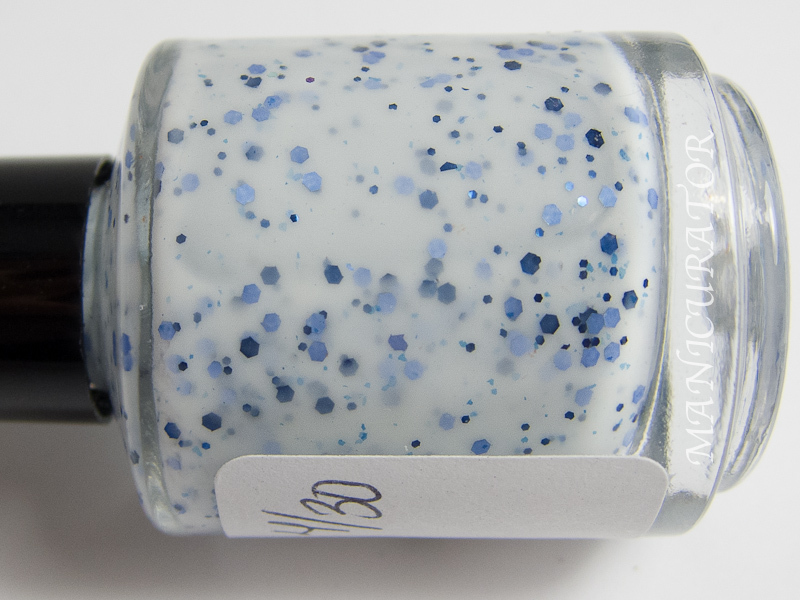 A Calm Does Not Suit Me- A white crelly base with periwinkle and navy glitter. I'm pretty sure I used 3 coats here. But it might be two. This is why I need to write stuff down! I usually take notes while I swatch, I forgot to this time..sorry! The application was easy and the formula was without issue that I know! The top coat worked great for me..and check out this MEGA size!! I love it. It's quite affordable too, it's a 1.12oz bottle for only $6.50. For those of us who go through top coat like it's water...get this :) I had no issues of shrinking and dry time was good. I used it in all of these swatches, have not yet tried it over nail art though. Only I Remain - Shades of blue and green glitter in a clear base. 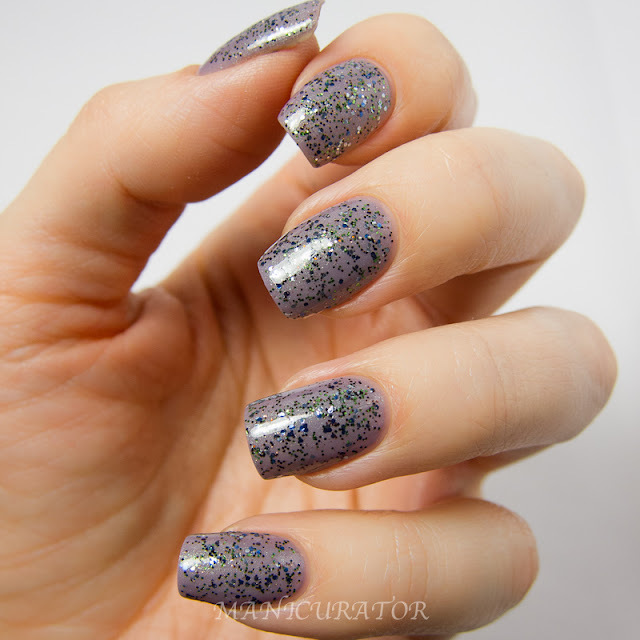 I used one coat over 2 coats of Contrary Polish Better Together. No problems with formula or application. 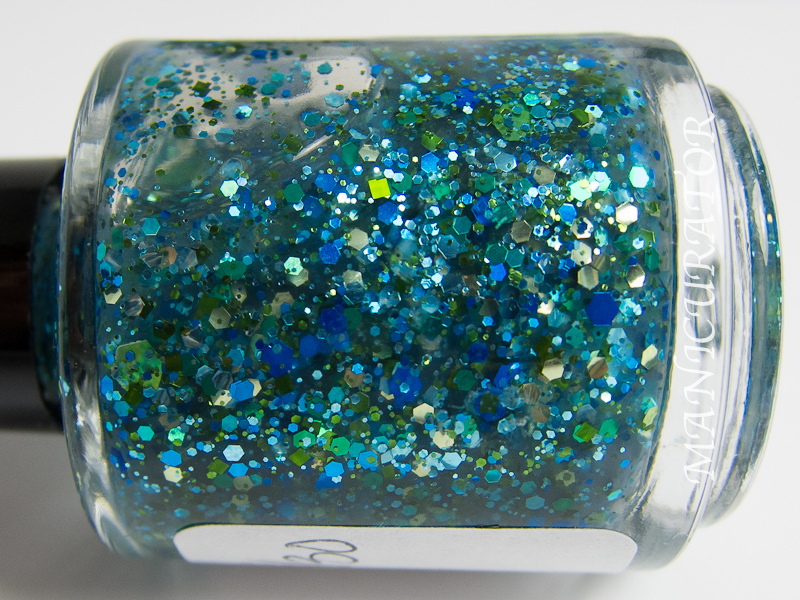 Handful Of Dust - Consist of micro swamp green,brown,and copper glitter, fine navy glitter, and fine black dust. 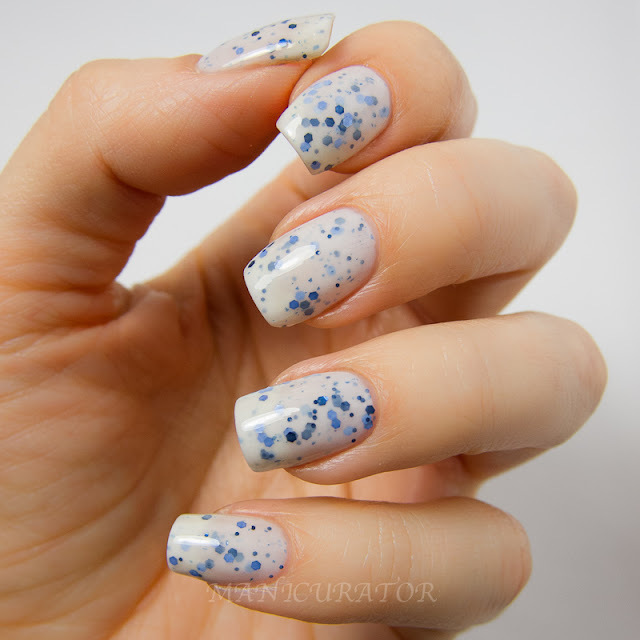 I layered one coat over Contrary Polish Play Me. Again, easy application, no issues. On A Beach Somewhere-Mango papaya scent. Ingredients-Extra Virgin Olive Oil, Coconut Oil, Avocado Oil, Jojoba Oil, Flax Seed Oil, and Lanolin. And now for the verdict? IN THE MOST LOVE!! I've used all of them except On a Beach (which I don't have but now need more than life). I use them every day in fact, this winter is really doing a number on my hands and cuticles and this oil is helping A LOT. The smells are delicious and not at all overpowering. WOO!! They also come in a large bottle and are super affordable!! Have a great weekend everyone! Gotta get my boys outside to play in the snow!!!! The white one is gorgeous! What a pretty collection! I love the first polish especially. Those cuticle oils sound amazing (and delicious :P) too! eSSES ESMALTES SÃO TDO DE BOM HEIN MENINA! 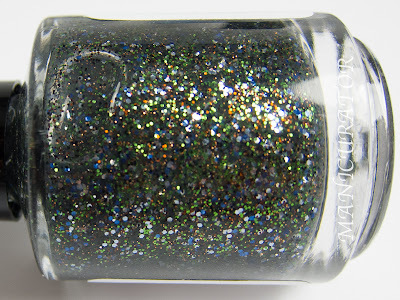 That first polish, so gorgeous!